What is your Evaporation Rate? Hot Weather Concreting. - McAlvain Companies, Inc. 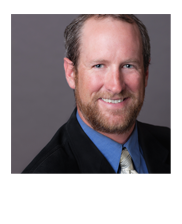 In an arid climate like Southern Idaho, knowing what the expected evaporation rates are projected to be is critical before concrete slab pours. Why are evaporation rates of such concern during the hot summer months? Plastic shrinkage cracks! Per ACI 305R 2.1.4, “Plastic shrinkage cracking is frequently associated with hot weather in arid climates. It occurs in exposed concrete, primarily flatwork”. This correlates with the conditions that we commonly see in the Treasure Valley during the summer. So, how does the evaporation rate fit into this condition? Again per ACI 305R, “Surface drying [the condition when plastic shrinkage cracks often occur] is initiated whenever the evaporation rate is greater than the rate at which water rises to the surface or recently placed concrete by bleeding”. It is clear by this statement that planning for expected evaporation rates before pouring concrete is vital for successful slab curing during hot weather conditions. 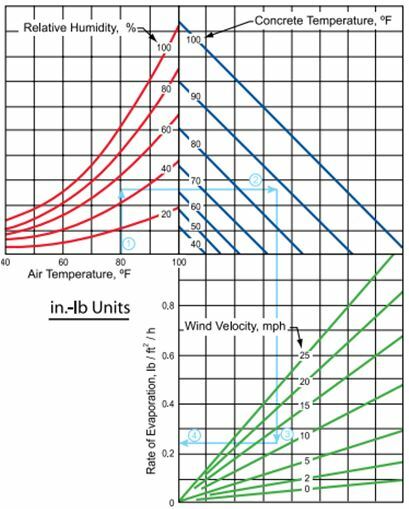 There has been an abundance of research completed on analyzing what the critical evaporation rates are for concrete in a wide variety of climates. In Southwestern Idaho, a hot and arid climate, the critical evaporation rate is .2 lb/sqft/hr. What does this mean and how do we identify this? Evaporation rates are calculated based off the following factors: Concrete and Air Temperatures, Relative Humidity, and Wind Speed. Ambient air and concrete temperatures are easily obtained using thermometers. Relative humidity is obtained from local weather websites. Wind Speed should be monitored at 20 inches above the slab surface, the wind speed can be especially tough to measure. 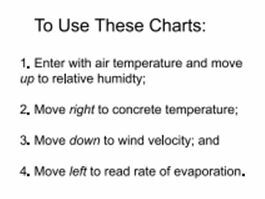 Once all of these factors are known the next step is to utilize the below nomograph (figure courtesy of Portland Cement Association) to correlate the expected evaporation rate. 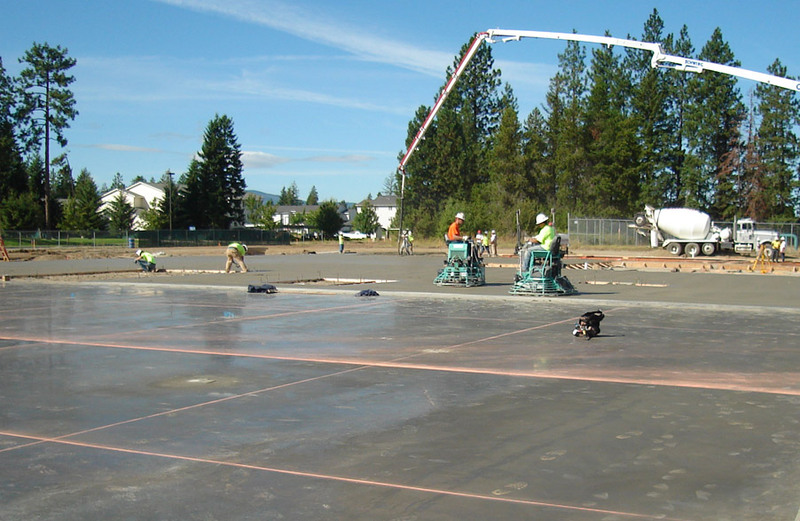 This entire process is often beyond the capabilities of an onsite crew during typical pour conditions. Based on this forecast, evaporation rates expected in the Boise area for the next 4-days all land near or within the critical range identified by ACI. While jobsite conditions and actual evaporation rates may vary from this forecast, it is a useful tool that provides an easy estimate of what should be expected on pour day. So evaporation rates are at or near the critical range, what do we do now? Stay tuned to our next blog update or hire McAlvain Concrete and we will discuss preventive measures that can be taken to reduce the chance of plastic shrinkage cracking in your next concrete pour.